In a sauce pan or wok, sauté garlic and onions in cooking oil. Add ground beef, ground pork, laurel leaves, bell pepper and a cup of water. Bring to a boil and let simmer for 10 minutes. Add brown sugar and hotdogs. Continue to simmer for an additional 5 minutes. Optional: add hot sauce e.g. Tabasco for more spice if desired. 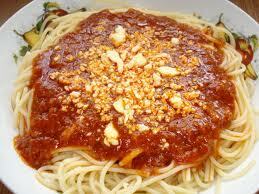 Serve with the cooked spaghetti noodles and grated cheese on top.